A lawsuit that alleges Yahoo's email scanning practices are illegal can proceed as a class action complaint, a development that will shine the spotlight on the Yahoo Mail use of messages' content for advertising purposes. Plaintiffs allege that emails sent to Yahoo Mail users by people who do not have Yahoo Mail accounts are scanned by Yahoo in violation of federal and California wiretapping laws. 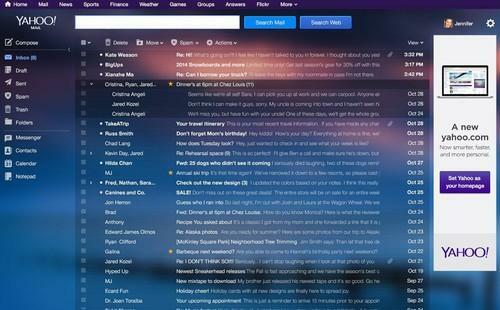 In a decision Tuesday evening, Judge Lucy Koh said all U.S. residents who are not Yahoo Mail subscribers but who have sent emails to or received emails from a Yahoo Mail subscriber between Oct. 2, 2011, and now may sue the company. California residents who are not Yahoo Mail subscribers but who have sent emails to or received emails from a Yahoo Mail subscriber between Oct. 2, 2012, and now may sue the company, according to the judge's filing in the U.S. district court in the northern district of California. The plaintiffs, who filed for class certification on Feb. 5, allege Yahoo copies the entirety of emails, extracts keywords, and reviews and extracts links and attachments, in violation of the federal Stored Communications Act and California's Invasion of Privacy Act. Yahoo, in its FAQ on Mail, says that its automated systems scan and analyze all incoming and outgoing messages to detect, among other things, certain keywords, partly to provide interest-based ads but also to detect viruses and malware. The lawsuit alleges Yahoo provides no mechanism for non-Yahoo Mail users to opt out of Yahoo's scanning practices. In her decision, Judge Koh sought to distinguish the case from a previous and similar one over which she presided in 2014 in which she refused to grant class action status on behalf of Gmail and non-Gmail users, because it was too difficult to determine which users agreed to Google's scanning practices. In Yahoo's case, plaintiffs seek injunctive relief requiring Yahoo to stop scanning the emails of non-Yahoo Mail users without their consent, and to identify everyone with whom Yahoo has shared or sold information or data collected from non-subscribers' emails, according to the court document. Daniel Girard and Larry D. King, attorneys for the plaintiffs, did not immediately respond to requests to comment.